Preston manager Graham Westley says he had no fears about giving Steve Simonsen his league debut for the club. 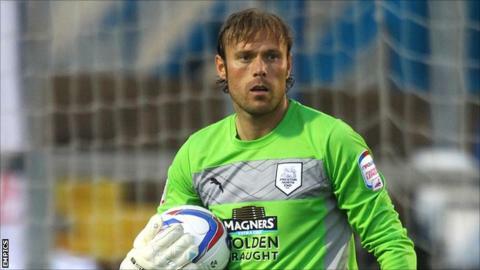 Simonsen replaced Thorsten Stuckmann in goal for the 5-0 win over Hartlepool. Westley told BBC Radio Lancashire: "Having a Premier League goalkeeper between the sticks isn't the biggest gamble any manager will take. "Steve has a lot of experience, he's very good with his feet and we saw great evidence of him helping to get the team playing from the back." Former Everton and Stoke goalkeeper Simonsen, signed on a free transfer in August, had started in the Carling Cup and Johnstone's Paint Trophy for Preston but had not appeared in the league for the Lilywhites before Tuesday. North End had been beaten 2-1 by Crawley in their previous fixture and Westley made five changes to his side for the game at Deepdale. "The players responded very well," added Westley. "They showed they'd learned some lessons from the weekend. "I thought they were a credit to the football club and went about their job in a very professional way." Preston are fifth in League One and travel to Walsall on Saturday.